How to Take Care of Your Digital Camera in Cold Weather! Special Care is Necessary When Using Your Digital Camera in the Cold! It’s that time of the year for many of us around the world, when the dreamy warm days of autumn slip into the bone-chilling, teeth-chattering days of winter. 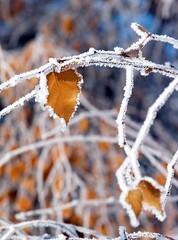 But wintertime can be the best time for getting fabulous shots like the frosted leaf showing here. While there are gray days, there will also be days of brilliant blue skies, bright golden sunshine, and sparkling snow blankets, dazzled in twinkling diamonds. How can anyone resist shooting photographs under those conditions? I certainly can’t. But along with wintry conditions comes cold, and digital cameras (and their batteries) don’t like extreme temperatures of either variety, hot or cold. So, you must take precautions when using your digital camera outdoors in the winter.